Please read the F.A.Q. if you're having issues! Open Minecraft Note Block Studio is a open source continuation of Minecraft Note Block studio, created by David Norgren. Because he stopped development on Minecraft Note Block studio, I asked him if I could make it open source, which he allowed. Create remakes of your favorite songs or original compositions in a user-friendly interface, without having to worry about redstone or Minecraft's 2 octave limit. You can even add your own instruments! Not a musical genius? Don't worry! The internet is full of music in the MIDI format, available in all kinds of music and all sorts of artists. Just make a quick Google search for your favorite song and open it in the program! Open Note Block Studio supports the 6 new sounds added in Minecraft 1.14! You can also export your song as a datapack, This way you don't need any other 3rd party tools and you also don't need any (note) blocks! Once you have finished a song or imported one from a MIDI file, you can easily import it into your Minecraft world using Schematic files, with the help of programs such as MCEdit. Have you built a song in Minecraft that you want to edit? Well, you can do that too! Just select the space that your song is in and export it as a Schematic, again, using MCEdit. You can then open the Schematic in the Minecraft Note Block Studio! You can also export your song as a MP3 file that you can then share, use in a video or remix. All this and much more for a stunning price of $0.00! challenge in composing a great note block song. Q: I'm getting graphical bugs! A: Update your graphics drivers, see this: https://help.sketchup.com/en/article/36254, also try the things above. Q: How do I run this on a Mac? A: This program is currently not Mac compatible. However, some people have managed to run this using Crossover and Wine, but I cannot guarantee that it will run as smoothly as on Windows. Q: What Minecraft version is this for? A: Version 3.3.5 is targeted towards Minecraft 1.13.2 and earlier. Q: Can I open a .mp3 or .wav file and convert that into note blocks? A: .mp3s and .wavs are actual audio, while the note blocks, much like .mid files are nothing but instructions, telling the computer where notes are played, their pitch and instrument. No software can convert actual audio to instructions properly, due to the differences between the formats. If you want to convert a well known song, there's a chance somebody may have manually translated it into MIDI already, in which case you can try doing a Google search for your song in the MIDI format and then import that. If that fails and if you are really desperate, there exists MP3->MIDI converters, but the results are often disappointing for the reasons mentioned above. Q: How do I use this program? A: The tutorial videos, found here cover the main features of the program. Additional, non-official tutorial videos made by the community are available in a few languages, such as German, French and Czech and can be found in the list above. Q: What's with the tempo restriction? Minecraft at its original playback speed. When exporting as a datapack, additional values are allowed, like 20, 6.66, 4, 3.33 and 2.86. Note Blocks, but to commands, and these aren't restricted to redstone update rate. Q: When I import a .mid file, it sounds terrible! note blocks at once, lowering their pitch/octave and even changing their instrument. Edit: v3.3.6 is now out with support for the new sounds! Thanks very much for the update with the new sounds. Hey Developper. Please make sure you are been trusted by Microsoft. Beacause the Windows Defender was not trust your open program. And maybe all orthers anti-virus can say the same thing. Your Noteblock app is not verified by Microsoft. 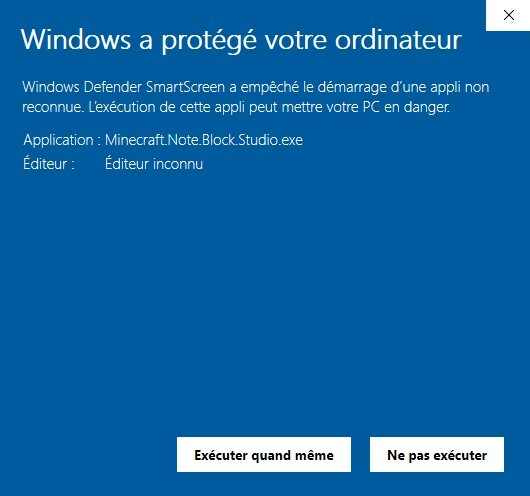 Im at Windows 10 and I was protected by Windows Defender. Soo you know now, whats Microsoft needs. Is a verified user. To see in English, just do Google Translate. But is not hard to see. There's still a way to run the application even if antivirus doesn't like the app, if you haven't already done that. Hi, I'm trying to play a datapack in the newest snapshot, but nothing is playing. Any idea what's going on? Never mind, I had my sound muted like an idiot. Smartscreen is made to stop hackers by blocking fake apps. Is here to not get into trap. ONBS can be flagged beacause is the same code, but author unknown. But Windows think is safe on Zip. IDK why is not trust the installer. Huh, i got a error when i launch the exe edition. For issues and suggestions, please open up an issue on the Github page. You can fix your issue by reinstalling ONBS. Yeah Windows doesn't trust exe files downloaded from the internet, just choose "run anyway", or download the zip, extract it, and run the exe in the extracted folder.